Disappointed! Used 4 times and let air-dry each time, and it’s rusted at the tip part of the brush already. Now I see why they include two of them, but still not a good deal if they only last me four uses each. Other than that, they seemed to be good, easy to reach, bottle brushes. I’ll include a pic of the rusted part. These are just what I need to clean the beer bottles I use to make water kefir!! They are plenty long and have bristles on the top of the brush to clean the inside bottom of the bottles nicely! And I got 2 for under 7 bucks!! What a deal! 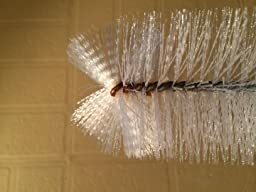 Bristles are firm enough for cleaning, yet soft enough for easy flexing and return-to-normal durability.